Chrysanthemum 'Mary Stoker' (A rubellum variety). 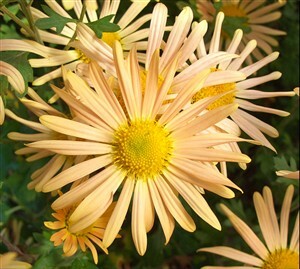 This is a lovely earlier flowering Chrysanthemum with warm salmon flowers. The pink intensifies as it ages. Very hardy and reliable. Came through the winter of 2009 outside, with no protection, with ease.